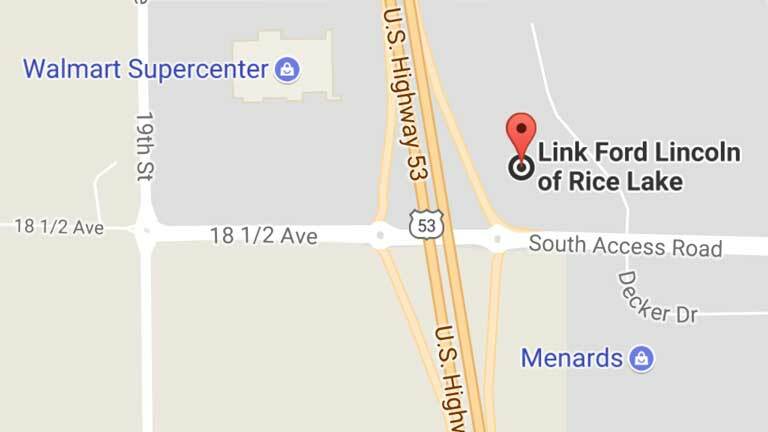 In our Service Department at Link Ford Lincoln and RV of Rice Lake, we are committed to excellence. Our experienced service team is comprised of ASE (Automotive Service Excellence) and I-CAR (Industry Conference on Auto Collision Repair) certified technicians and advisors, which means when you bring in a vehicle with a problem, we solve it and solve it right the first time. We will perform any needed repairs and help you maintain your vehicle to get you back on and keep you on the road. We work on all makes and models, including heavy duty and diesel trucks, as well as Class A, Class C, and diesel pusher Recreational Vehicles. We use the highest quality parts at a value that cannot be beat. With our extended service hours, we are here when you need us, including early morning and mid-evening. Need a loaner vehicle or a ride while getting service done on a vehicle? We have a dedicated variety of new Ford and Lincoln loaner vehicles for you to borrow. In addition, we have a service shuttle available to drop you off or pick you up from work or home, to grab a bite to eat, or do some local shopping, instead of waiting in the customer lounge for your vehicle repairs to be completed. To set a service appointment click below, call us directly at 715-234-8196 or 877-505-1900, or email us at bestdeal@linkmotors.com.